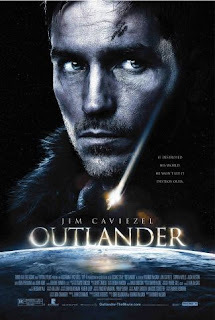 Outlander begins when a space craft crashes onto planet earth. The ship lands in a lake situated around the local fjords of ancient Norway in the time of the Vikings. From the wreckage emerge two bitter enemies: a soldier from another world that spoke Icelandic for some unknown reason and stated that he came from an Island to the North Kainan and a bloodthirsty creature known as the Moorwen. Man and monster both seek revenge for violence committed against them. As the oorwen ravages the Viking world, killing everything in its path, Kainan forms an alliance with the primitive but fierce warriors. Whilst trying to hunt for the Moorwen, war brews among the Vikings, which ends with both sides taking immense losses. As the enemy Vikings retreat into the forests, the Moorwen strikes, leaving the vikings no choice but to run for help to their once close enemies. Together, the two sides attempt to destroy the Moorwen as a single band of Vikings. The Vikings thus construct a pit filled with oil to lure the Moorwen inside and plan to ignite the fuel, burning the Moorwen, with the help of Kainan. The plan to incinerate the Moorwen fails, leaving the village to take massive casualties, and with the surprise that the Moorwen had given birth to a new, younger Moorwen, which surprises the Vikings from behind and killing the Viking Leader in the process. This leaves the villages in fear and its warriors demoralised, most leaving the village in search of a new home and safety. Kainan and a remaining loyal Vikings stand together to destroy the Moorwen once and for all. Kainan thus realizes from the last battle that the Moorwen is almost impenetrable with the current metals used and thus extracts metals from his sunken space ship. Giving the metals to the smith, he combines his advanced technology with ancient Iron Age weapons, and goes on to the final battle with the Moorwen.